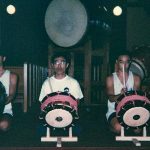 Eien Hunter-Ishikawa is a musician and educator based in Portland, Oregon specializing in drumset, taiko, percussion, and shinobue. 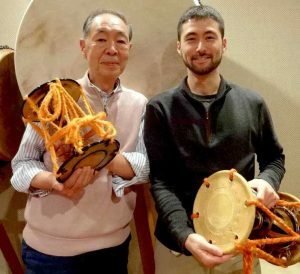 Born in Japan, his passion for drumming started at an early age through the involvement of a youth taiko ensemble directed by Saburo Mochizuki, a founding member of Tokyo’s pioneering taiko ensemble Sukeroku Daiko. Among many other accomplishments, Eien continues his studies of the traditional Japanese music forms of Edo Bayashi (festival music of old Tokyo) and Edo Kotobuki Jishi (lion dance of old Tokyo) through master musician and dancer Kyosuke Suzuki. On a more personal note, Eien is a great friend of Ho Etsu’s! He’s coordinated our upcoming residency with Suzuki-sensei, greatly supporting our preparation for Sensei’s visit. 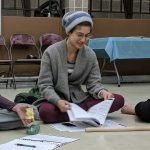 He’s reviewed practice videos & trip logistics, conducted private lessons, connected us to like-minded enthusiasts…and has even written this blog post! It’s an honor to work alongside such a passionate individual. Thanks for this incredible opportunity Eien! I actually love vegetables – is that weird? This was my first thought regarding the previous entry in this blog series, where learning Edo Bayashi was implied to be the taiko equivalent of that side dish of steamed broccoli or carrot sticks. Sure, I can understand that viewpoint. 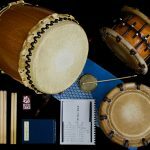 Compared to typical taiko music, Edo Bayashi involves learning a lot more notes, lacks flashy moves, is not commonly seen in performance, and yet the skill-boosting benefit of studying this music is irrefutable. For those of us who have become devoted students and fans of this music, part of the fascination comes from recognizing the richness associated with a traditional form with hundreds of years of history. The more you dig, the deeper and more interesting it gets. I like to think about Edo Bayashi as if it’s a piece of rock. Before the Edo period, various fragments of dirt, sand, and other stuff existed in the region. These rustic materials were used as ingredients during the artistic growth and innovation of the Edo period, and then combined into a form. Over decades and generations, extraneous material was polished off while new, cooler material was added on by the practitioners. This is the essence of traditional arts – the item is clutched, worked on, and then passed on to the next group. The Edo period started in 1603, and it’s easier to understand the depth of this festival music when we consider how many hands have shaped it into the current version. 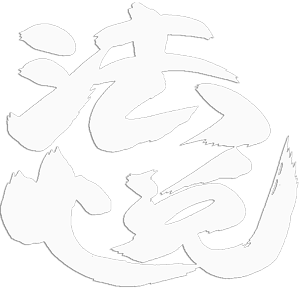 It’s very likely that every single note or rest we play in Edo Bayashi has a reason behind it. Growing up near Tokyo (formerly Edo) in Saitama, I was immersed in festivals and their music since before I can remember. 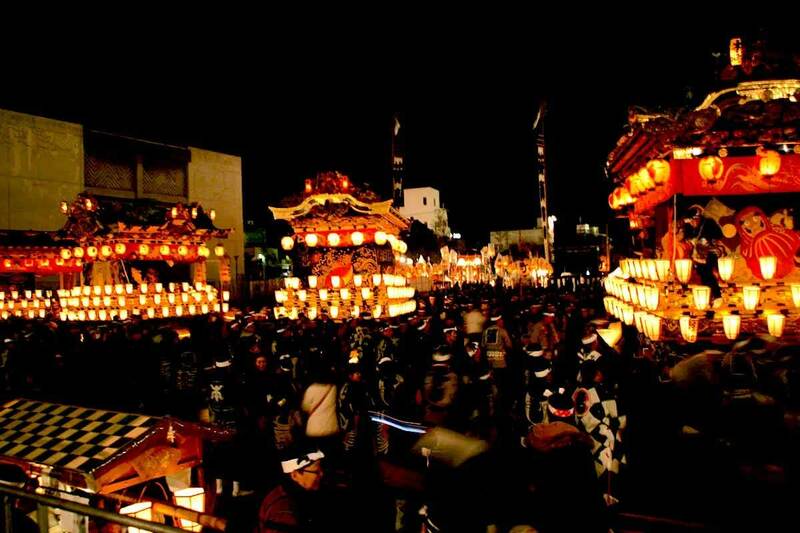 My best festival descriptor is funiki, the Japanese word for atmosphere or ambience. 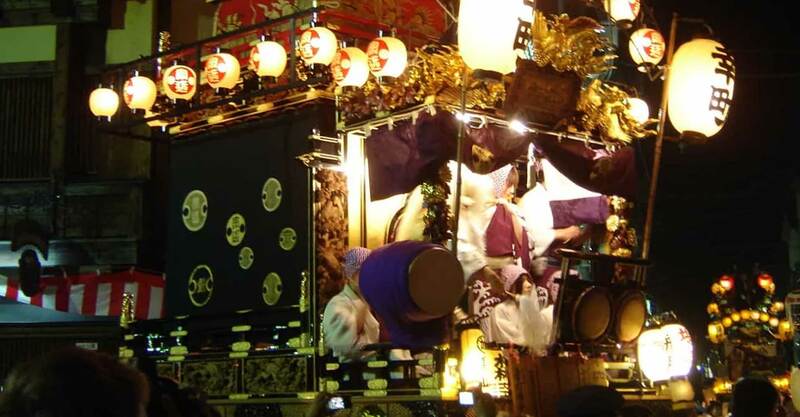 It’s an exciting combination of a big street party, lots of crave-worthy food options, fun games, traditional attire, beautifully crafted mikoshi (portable shrine) and dashi (carts, or floats), and of course the continual music that becomes part of your skeletal composition after a full day of exposure. It’s fun and exhausting, a sensory overload mixed with the deep appreciation for the history and culture just as significant to people in this modern age. Even as a kid, I liked vegetables. We had a large garden, and the hard work of planting, watering, weeding, and harvesting connected me to the many fresh fruits and vegetables collected for our table. 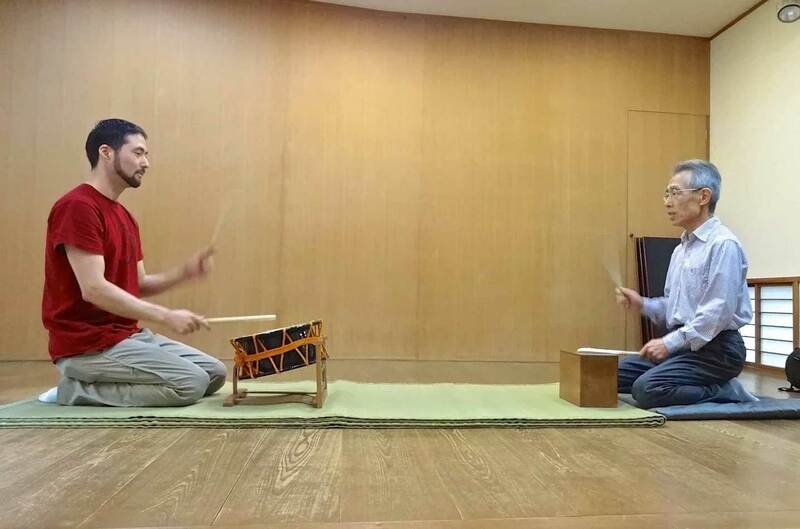 And it was during this age that my first study of Edo Bayashi began under the direction of Saburo Mochizuki sensei, one of the founding members of the pioneering taiko ensemble Oedo Sukeroku Daiko. 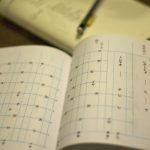 In my recent interview with Kenny Endo, I learned that Saburo sensei had studied with Wakayama Shachu, the group that created the standardized sheet music and recordings we all currently study. 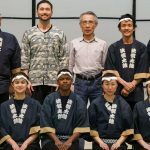 Kyosuke Suzuki sensei is currently one of the top performers and instructors of Wakayama Shachu, and Kenny was also learning the Wakayama Ryu matsuri bayashi (festival music) and shishimai (lion dance) during his 10 years in Japan. 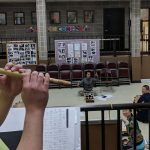 I remember my first Edo Bayashi performance after months of memorizing and practicing the patterns for the tate, which is the lead part of the ensemble. Other members of our youth taiko group filled in the waki parts, and the ensemble was augmented by Saburo sensei, his wife, and another Sukeroku Daiko member on shinobue, atarigane, and odaiko. I felt a blend of pressure to play the right notes, exhilaration of performing with my teacher and other professionals, and the delight of the special funiki created by the music. At that moment, no one could have predicted that many years later I would move to Honolulu to reconnect with Kenny and to relaunch my study of Edo Bayashi, which would eventually lead to meeting Suzuki sensei and having many opportunities to learn from and perform with him. It’s a big full circle full of connections and I’m not sure if it’s called serendipity, or just coincidence, or something deeper. Being a huge festival fan, I seek them out whenever possible. 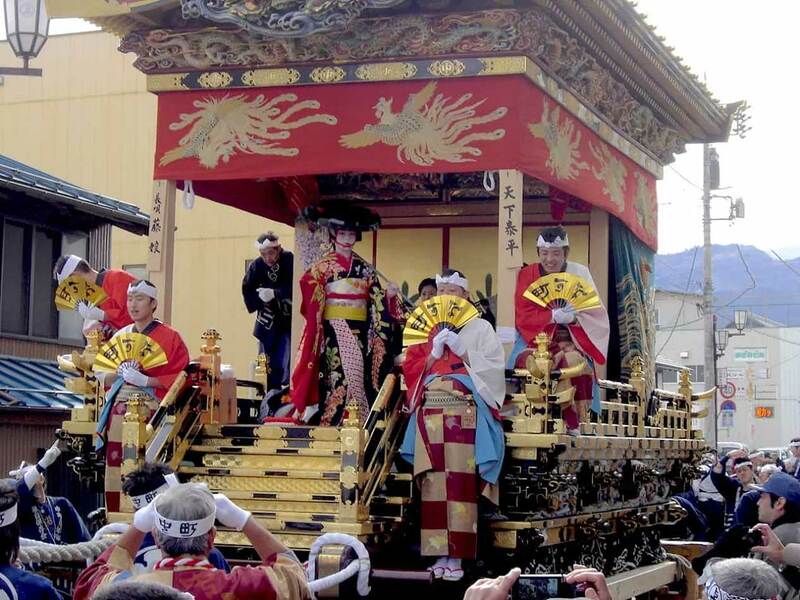 Some of my favorites include the Sanja Matsuri (Asakusa’s festival and home of Edo Bayashi), Chichibu Yomatsuri (in Saitama and origin of Chichibu Yatai Bayashi), Kawagoe Hikawa Matsuri, Kyoto Gion Matsuri, and Sawara Aki Matsuri. 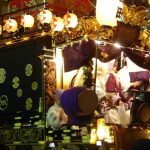 These are all unique and fantastic, and there are so many more amazing festivals all around Japan to check out. If a trip to Japan is not possible, there are now countless videos found online of any festival you might be interested in. Sometimes the best content requires a search in Japanese so it’s worth seeking help from someone familiar with written Japanese. 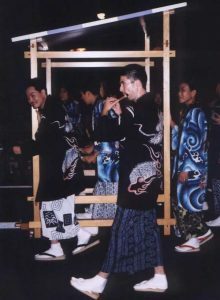 For Edo Bayashi, there are plenty of videos of Wakayama Shachu (some are on my website) performing during festivals, and seeing their professional version in this proper context is invaluable. Another idea is to look for performance opportunities appropriate to festival music, such as a Japan Fest or a holiday parade. 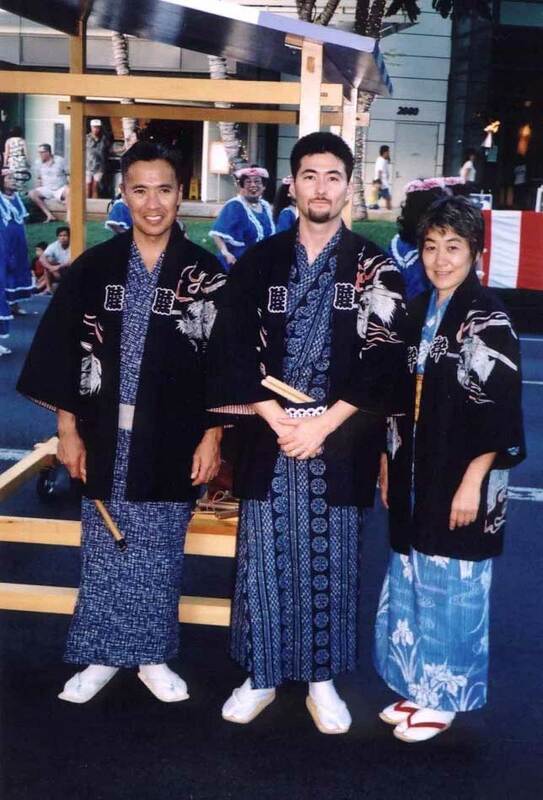 It would be wonderful to present matsuri bayashi on a dashi with yukata (casual summertime kimono), and doing this would bring players and audiences closer to the original purpose of Edo Bayashi or any other festival music. And perhaps this is the ultimate ‘reward’ for learning all those notes and sitting seiza (formal sitting position with legs under you) for hours – getting a peek into a deep tradition with many layers of meaning and intention, and at the same time contributing to a party atmosphere where everyone can relax and enjoy the funiki. The timing of this blog is significant. 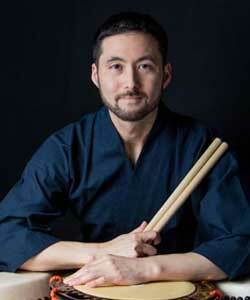 On April 11th, Suzuki sensei will begin his three-week US teaching and performing tour. 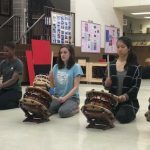 The first stop is Chicago for a residency hosted by Ho Etsu Taiko, followed by ten days with TaikoArts Midwest in Minneapolis, another hotspot of Edo Bayashi students and enthusiasts. The final stop is at the Kaoru Watanabe Taiko Center in Brooklyn for a weekend intensive. Anyone interested in workshops and concerts will find links on my website’s events page. I will be traveling with Suzuki sensei as translator and road manager, so feel free to contact me with any questions about this tour or recipe ideas.